Julie Dye is a jewelry designer in Largo, Florida. 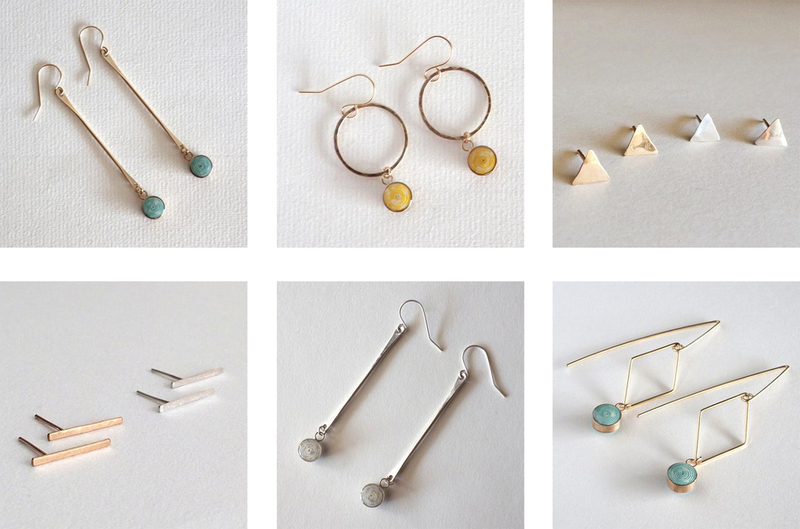 Her online shop, Blossom and Shine is full of simple, pretty designs at great price points- as the bar or triangle studs are $18 and the others, just $45. Although the smaller earring designs are in trend, they're not trendy as they'll be just as modern and lovely today as they will be twenty years from now. See more of Julie's beautiful creations, which includes necklaces, rings and bracelets, here. I love my state of Georgia so I always like to share the work of artists who promote a bit of state pride. 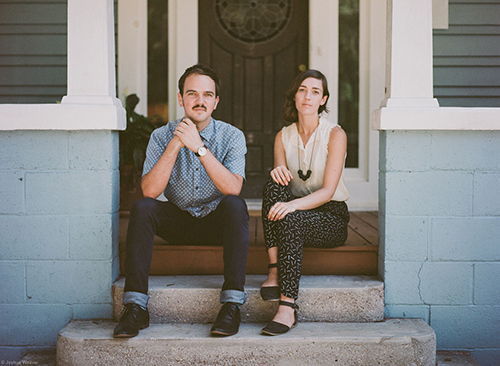 Husband and wife team, Eric Rewitzer and Annie Galvin founded 3 Fish Studios back in 2007. Together, they've amassed a vibrant and playful collection of state prints that showcase state flowers and prominent colors. Annie had a vivid dream about bears about 12 years ago and has been painting them ever since. When she added the shape of a state inside a bear hug, an iconic image was born and a whole series of illustrations came to life. The duo work together to paint and print and are deeply involved in their local artist community. Check out the entirety of their collection, which includes linocuts, postcards and magnets, here. Surya Sajnani of St. Petersburg, Florida has the wee thing down. In her shop, Wee Gallery, she creates the sweetest items for our little ones. 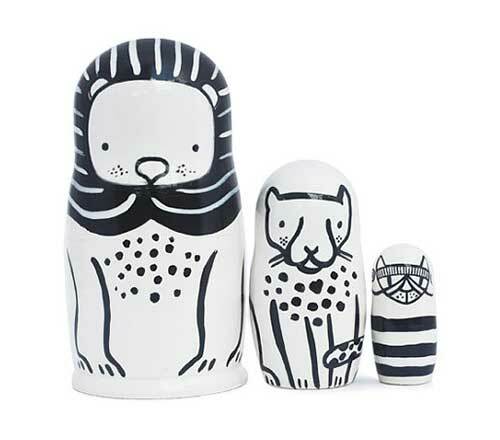 These nesting dolls come in sets of three and are meant for kids age three or older. I first found Surya's work at a shop in San Francisco a few months back. Her Art Cards for Baby were a perfect gift for my friend Tiffany who just had a baby. These cards feature high contrast and repeating patterns which helps to stimulate visual development in infants...use as flash cards or as artwork inside or near the crib. 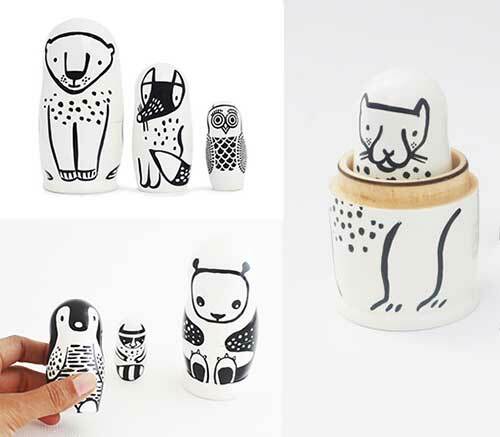 Her signature black and white designs carry through in wallpaper, decals, toys, blankets, pillows, tattoos, mobiles and these adorable ceramics and activity books. Check out the entire Wee Gallery shop, here. 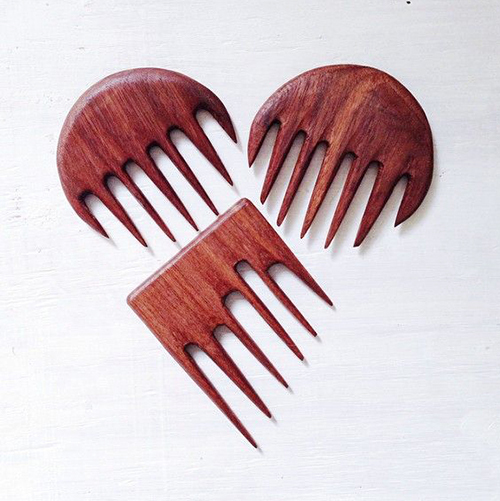 I can't help but love a wooden comb, especially these, handcrafted by Cainnon and Kiki Gregg of Tallahassee, Florida. They're made with all hair types in mind and meant to be versatile- for tangled curls, pinning up long hair or even managing unruly beards. I love how all the wood used for the combs is salvaged and southern. Cainnon, "Our walnut was salvaged from my great uncle's farm in East Tennessee, our oak is from a fallen tree in Piedmont Park in Atlanta and our hickory was pulled from the Suwanee River down here in Florida." Check out the entire wooden comb collection, here. These affordable, rugged and chic bags are made of water resistant duck canvas. I love their sleek, minimal style, which is a signature for all Yield Design products, including the handsome canvas and leather apron, above. Simple and uncomplicated is how most guys like to keep their shopping experience. So may I suggest a good go-to wallet that fulfills both those requirements. 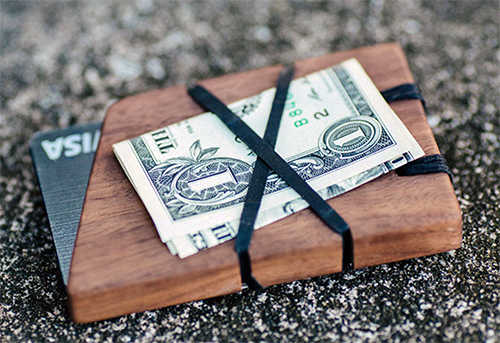 It's called the Voyager Wallet by Motive Goods of Orlando, Florida. Modern simplicity is on display here and in the prettiest way possible. 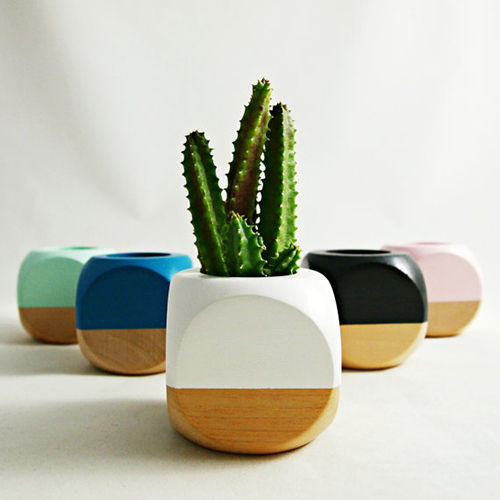 These small, wooden planters by Sea & Asters of Tampa, Florida quickly grab your attention and admiration. Check out the entire Sea & Asters shop, which includes pods, terrariums and tillandsia, here. Tallahassee, Florida was once known as the settlement of Anhaica. It's in an area of the panhandle that once belonged to the Apalachee people, one of the most advanced and powerful chiefdoms in Florida. Although times have changed, a hard work ethic can still be found in these parts. 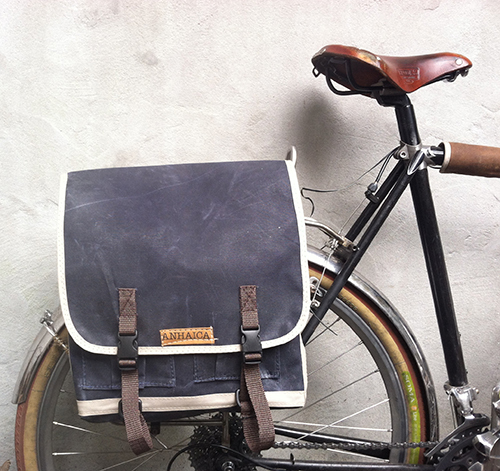 Marina Mertz of Anhaica Bag Works lives in Tallahassee where she crafts hand waxed, canvas bicycle bags and backpacks. Sewing and biking are her passions and her care for quality is top notch. Not wanting to use commerical beeswax, Marina found a local beekeeper (whose bees produce the wonderful, southern Tupelo honey) and taught herself how to hand wax all of her own canvas. So, with every bag she sells, both in the US and abroad, a bit of the South is shared with the world...I love that. The more I read about Marina, the more I want to be her neighbor. She's a special soul who cares deeply for her craft and her community. 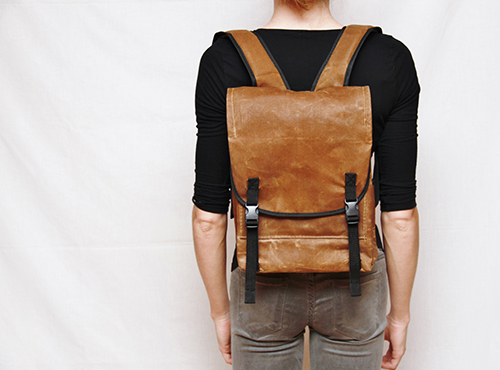 See all of her handcrafted bags, which include tool rolls, dopp kits, saddle bags and pouches, here. Husband and wife team, Robert and Brenda Zurn who recently opened their studio, DAMM out of St. Petersburg, Florida, believe good design incites conversation and inspiration. They seek quality in craftsmanship and care for their aesthetic as they continue to expand their unique and lovely lighting collection. Their Theorem desk lamp was inspired by the hypotenuse of a right triangle. The solid ash base is paired with a solid brass neck in either natural or black. And having a deep love of Italy, I loved reading about their Piazza lights, inspired by the Piazza del Duomo of Milan. The Noland was inspired by an Italian garden rotunda. It's nice to see how each piece is beautifully thought out with a keen attention to detail and form. 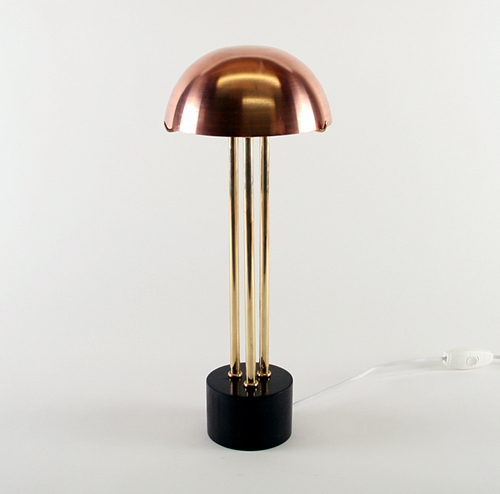 I'm a fan... check out all their lighting pieces, designed and built to order in their charming Florida studio, here. Deva America of Gainesville, Florida is a triple threat. She is a wax artist, vintage curator and textile designer. 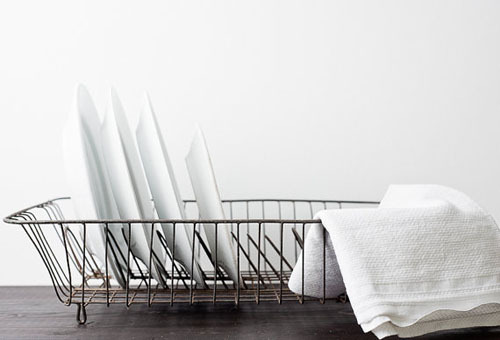 Her root vegetable tea towels are now on my new favorites list. These are hand printed on 100% cotton fibers with water-based inks. 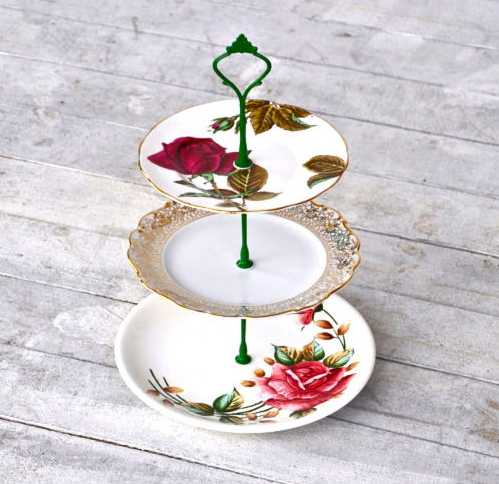 Deva collects lots of vintage home decor items and her textile designs reflect that passion. She has created over 50 tea towels to choose from with lots of luscious colors and retro inspiration. Plus, they're well priced at $10 each. Last week, my friend Sandy of the knitterati sent me a link to a cool hotel. 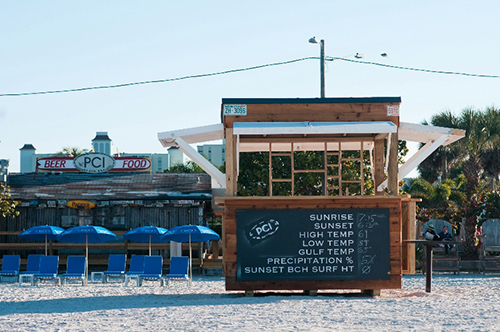 It's called Postcard Inn, located on the picturesque St. Pete Beach in Florida. 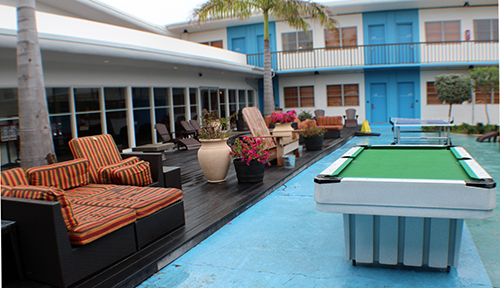 There's a pool, the ocean, good food and the best part...fabulous decor. Upon walking inside the Inn, you'll notice a communal, laid back vibe with natural light and plenty of spots to sit, chat and meet fellow travelers. I particularly love the wall of books in the lobby that were strategically picked for their color and content. Scattered among the new furniture and accessories, you'll find lots of vintage, one-of-a-kind pieces too. Designers, Tara Oxley of BR Guest and Chris Sheffield of SL Design are the creative minds behind this reinvigorated two story, u-shaped hotel (built in 1957 as the Colonial Gateway Inn) As stated on the site, "With an overlying theme of 'free space' and a powerful use of color, PCI echoes mid-century Florida vernacular with a few modern improvements thrown in for good measure." No two rooms are exactly alike, and with 197 rooms in all, that's quite a feat. Each room has a bohemian, surfer vibe with vintage lamps and new birch desks. The spaces feel bright and airy with white walls and white wood venetian blinds. All the duvets are down-filled with bright white covers, ready to dive into. 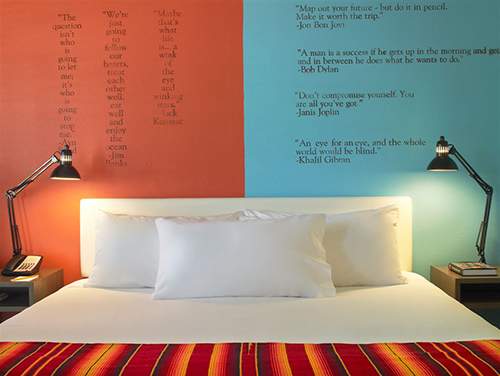 The walls behind the beds have either a floor to ceiling photo of a beach scene, vintage surfing photos or a lively series of quotes from legendary surfers as well as influential thinkers like Jay-Z, Janis Joplin or the Beach Boys. And then there's the beach, just a few steps away from your door....and the perfect beach restaurant hangout where you can try their signature burgers, seafood or BBQ. And of course, lots of ice cold beer. The Postcard Inn is now officially on my to-do list, thank you Sandy. And the best part is Florida and Georgia residents receive 20% off accommodations until December 14 of this year. Such a deal. Plan it all, here. You deserve it. Strong Boalt, a men's swimwear line was created in 2009 by fashion designer Amanda Boalt of Palm Beach, Florida. Amanda is the granddaughter of Lilly Pulitzer, an American socialite and fashion designer who became famous for her Florida inspired fashion whose pieces are light and cozy, vibrant and playful. Besides Ralph Lauren, where she previously worked, Amanda has been greatly inspired by her grandmother's fashion acumen and insights. Amanda, "While the style of Strong Boalt is more attuned to our time, I will continually hear her voice stressing fun over everything else." Amanda offers over two dozen classic swim trunks and board shorts in her shop- some plain colored, but mostly cool, inventine patterns like cabana stripes, elepahants, pineapples, fish or parrots. As she spends a lot of time at the beach or in the water, she is never at a loss for inspiration. I love the summer more than any other season so anything beachy, stylish -and this manly, has my attention. See the entirety of Amanda's summer swimwear collection, here. Yesterday, I happened upon this incredible shop, Ocean Rock Design, based out of Bradenton, Florida and was trying not to drool at all the great bag options. I love anything worn and weathered, made with a quality aesthetic. Veronique Lindell designs just a handful of bags at a time, all handmade with unique recycled fabrics, like vintage American workmen and military materials. The only thing new on each bag is the leather. This Crow's Nest Tote is made from a World War 2 duffle bag. Two large inner pockets, which can fit an iPad, phone or wallet are created from a vintage carpenter apron and then pieces of the duffle bag with a Veterans of Foreign Wars patch for that special added touch. 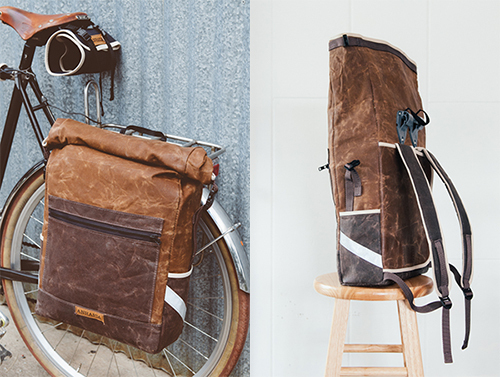 Each bag is roomy and worn in, with a story to tell. Veronique, who once worked in NYC as a Fashion Designer for Ralph Lauren and The Gap, is now back in Florida, close to her mom, who serves as the master sewer. She loves to be back down South, scouring local estate sales for good materials and original finds. The Camp Tote, left, is made with a 1940's duffle bag and fully lined with a vintage printed cotton Kimono from the 1920's, while the front of the bag has two vintage Boy Scout Badges. Ah, to collect all these bags would be too fun. Check out all the current offerings at Ocean Rock Design, here. I like a good cup, particularly any cup made by Makr of Winter Park, Florida. 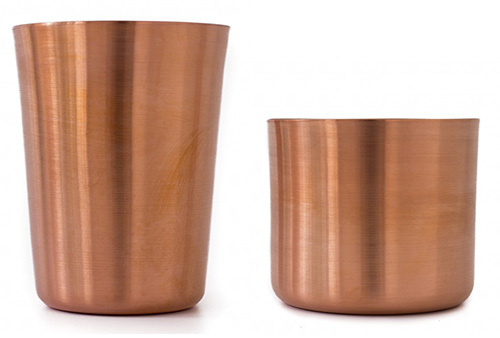 Their newly introduced tumblers are eye catching and beautifully made- a nice addition to any kitchen if you ask me. All of the tumblers at Makr are available in short, tall and tapered shape and work perfectly as a rocks or lowball glass. On these hot, southern days, I like the idea of one of these cool, classic tumblers filled with ice and tasty mixings, right by my side. A handsome shelf is important for any tumbler presentation. This one, also by Makr, is made of white powder coated steel and black walnut. 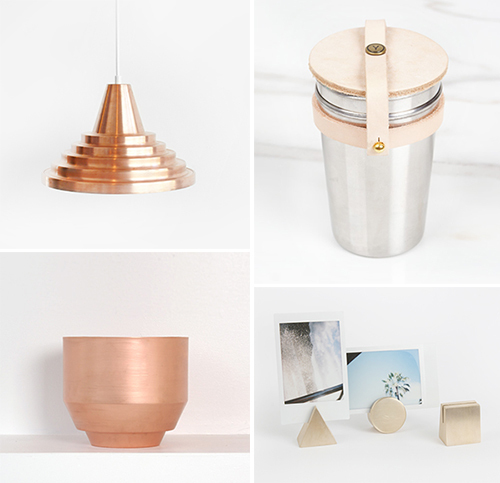 See the ever expanding shop of fancy, fine things in the Makr shop, here. Lights made back in the day of our parents and grandparents were durable, of high quality and built to last. Too often, in the desire to mass market with a lower price point, we've lost touch with the standard that once was and have settled instead for what is. Couple, Bryan and Donna Scott of Titusville, Florida saw this gap in the market and decided to fill it with their own brand of lights using only the highest quality, commercial grade materials. 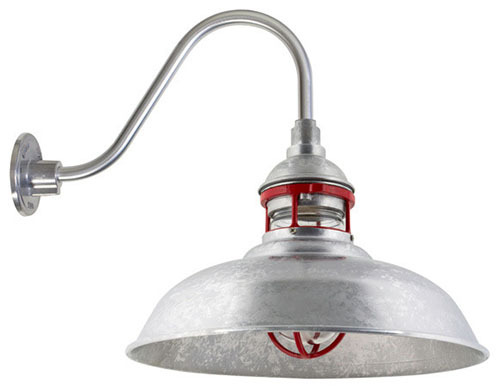 Bryan and Donna's shop, Barn Light Electric, focuses on barn style lighting, which, thanks to the desire for handcrafted, American made products and the rise in demand for industrial style furniture, has been a huge success. 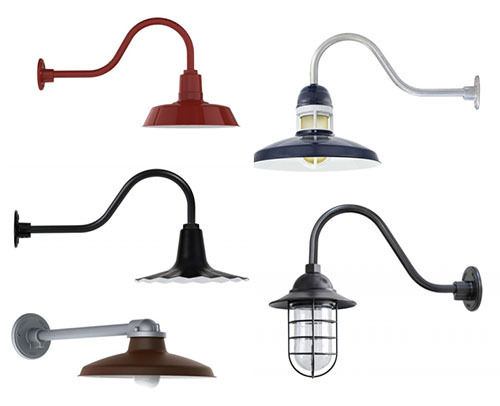 Many of their barn lights are built for exterior walls and porches and just as many work for inside too- to add a cool masculine vibe to an office, workshop, bath or bedroom. So many good ones to pick from, with lots of customizable options too. And truth be told- these lights work well for the women too. (Check out their gorgeous Veronica Valencia collection) Plus, their ever expanding line includes desk lamps, wall sconces, chandeliers, pendants and quite a bit more. So check out their site to peruse all the stylish options and feel safe in knowing, whatever you do decide on, it will be of the highest quality and built to last. Just like they used to make 'em. On the Form Function Form site, you'll find this description from founder Shawn Reed which helps describe the philosophy behind the brand, "In good design, there is a symbiotic relationship between the aesthetic perception of a thing and its use; neither is primary, both feed off of and inform each other. As a designer, as a human, I believe that something within us loves, even needs, beautiful things in our lives." 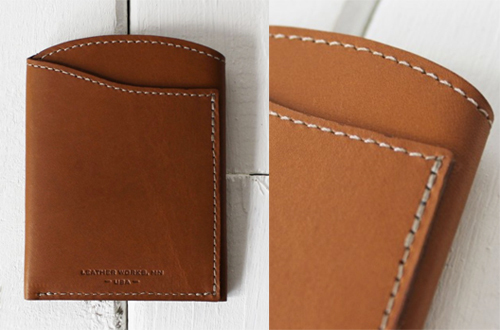 To achieve a high standard, the Form Function Form team utilize Horween leather from Chicago. 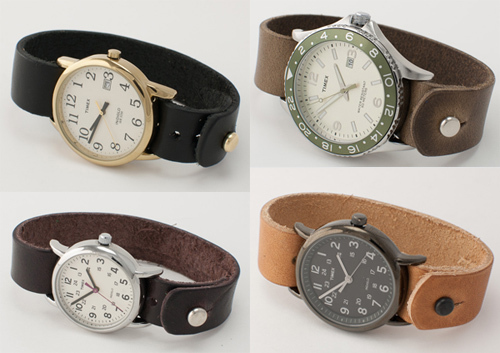 My favorite feature, however, is the button-stud strap. It's sturdy, practical and beautifully designed as the stud can be worn on the outside or the inside of the band. It makes one wonder why it took so long to make a watchband like this. If I had the talent of a good retailer, I think my first shop would be full of men's provisions. I just love them so. Men's things are often well made and timeless, with a simple beauty you don't always find in women's products. Cloak & Dapper is an American general store, based in Winter Park, Florida. Calvin Cearley Jr. founded the company after finding a lack of quality men's products in the marketplace. He partnered with NBA player Ryan Anderson and Orlando restauranteur, Kaleb Harrell to make this manly dream of his, come to life. What I love about Cloak & Dapper is that it focuses on the manly essentials. This includes practical yet stylish clothing, grooming products and accessories like bags, barware and books. As stated on their site, "We like to say, you basically need to own one of everything we have. And we mean it. 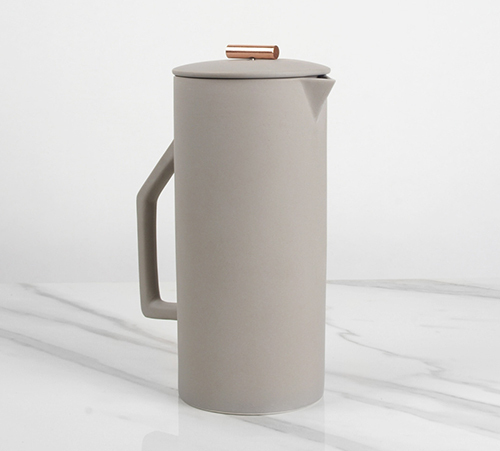 There's no redundancy at C & D. Each piece stands alone and fills a basic manly need." These men have good taste...and an incredible roundup of essentials for the modern man. I'm happy Calvin, Ryan and Kaleb saw a need and filled it. That's a good, manly trait, eh? Peruse the entire Cloak & Dapper, made in the USA shop here. It's a success story heard time and time again. A person is inspired to make something and does a little research. The product is made and turns out to be pretty good, much better than what's in stores. The product is then shared with friends. The friends like them. The person makes more product. Then someone says, "I want to order your product, how much is it?" And, there you have it, a business is born. The best part is each and every marshmallow at Wondermade is handmade. Nathan, "When things are machine made, the human touch is focused on rooting out defects. When things are handcrafted, the human touch is directing a product towards perfection. That's a really huge difference." See their site here for more scrumptious flavors or buy their 4 box gift set for Father's Day, which includes Bourbon, Beer, Maple Bacon and Coffee mallows for just $25, here. 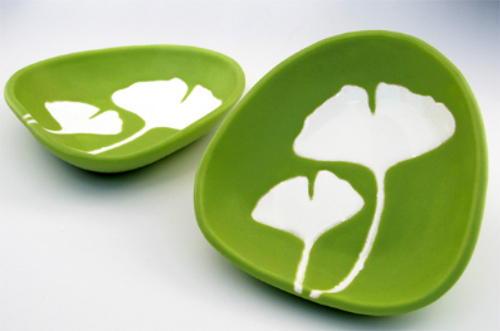 Like many women, I like pretty dishes. A small holder for my jewelry, my change, my excess stuff...all looks better atop a pretty dish. Wish is why I like the modern, natural forms found in Hope Johnson's ceramics. 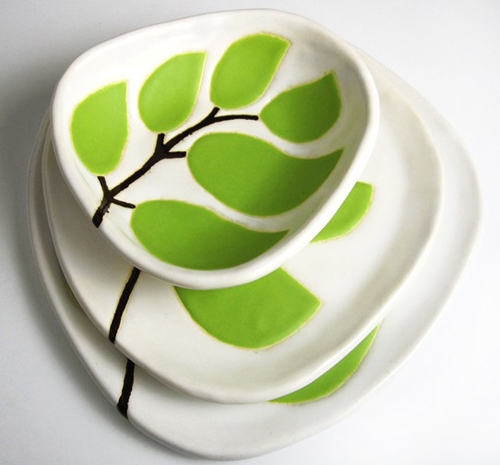 Based in North Florida, Hope is inspired by the organic shapes and colors of nature that surround her home. Hope's smallest dishes measure 1" wide, 3.5" tall and can be used for dipping sauces or as a place to hold your littlest things. It also looks pretty all by its lonesome on a bookshelf or table. 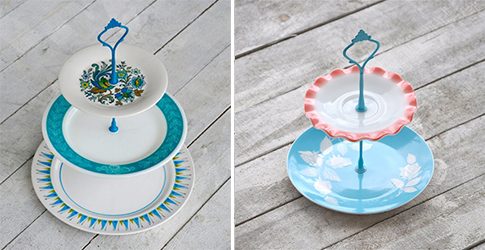 Peruse Hope's entire shop here, which includes cups, bowls and dish sets. 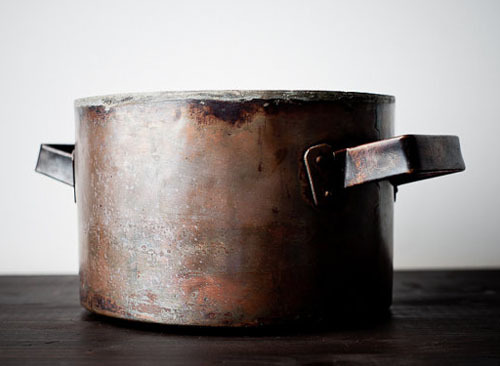 A primitive copper pot looks amazing against an old, weathered table. I've always wanted to find a vintage dish rack at a yard sale but no luck...good thing I found The Old Red Hen shop. 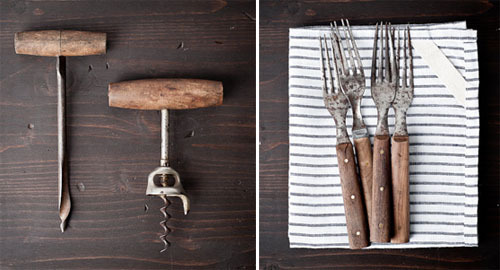 Peruse the entire gathering of vintage kitchen goods here.